Tennis elbow (also known as lateral epicondylitis) is a condition where the outer part of elbow becomes sore and tender. Lateral eepicondylitis is an extremely common injury among sports people and manual workers where repetitive strain occurs to the elbow. There may have been recent changes in training or technique, note-taking or equipment used in sport or work. This strain leads to microscopic tears in the tendons of the extensor muscles at the outer elbow. These tears cause degeneration of the tendons and inflammation follows. Unfortunately over long periods of degeneration this inflammation becomes chronic. Extensor muscles of the forearm: all wrist extensors form a common tendon. Damage to this tendon, often due to overuse, can lead to tennis elbow. Posterior interosseous nerve: a nerve that enters thru the supinator muscles can often be impinged along its course causing lateral elbow pain. Associated sensory symptoms, such as pins and needles, may indicate a nerve component. Referred pain from the cervical, thoracic spine and the shoulder can often contribute to causing the elbow pain. Referred pain is affected by prolonged posture, such as lengthy periods seated at a desk or in a car. If pain is persistent, unpredictable or related to posture, referred pain should be considered. Lateral elbow pain extending into the forearm and extensor muscles: pain usually builds up gradually. Inflammation may keep the patient awake at night. 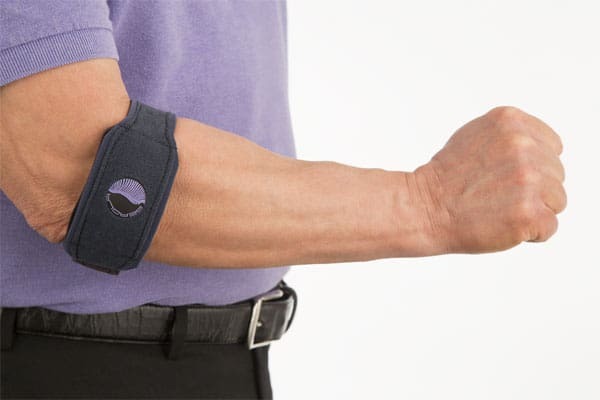 Tennis elbow can usually be diagnosed by a detailed history and physical examination. It is important in assessment to differentiate local elbow pain from that involving the neck or nerve structures. An activity history will also be taken, noting any recent change in the level of activity. In racquet sport players, any change in racquet size, grip size or string tension and whether or not any comment has been made regarding his or her technique. There are two stages involved in the management of tennis elbow. Activity modification or modification of training regimen. This phase will include exercises to strengthen the extensor tendons and for posture correction. Return to sport and activity follows.